1.Under 16 years old Children must be used this product under the supervision of an adult. ★【LED COLORS & OPERETION MODES】SOLMORE Professional 7 Channel DMX-512 LED Stage Light.Par Light has 4 modes:DMX, sound-activated, master slave, and automatic. Multicolor change: 36 LEDs (12 red LEDs + 12 green LEDs + 12 blue LEDs). Include Remote. ★【SPECIAL DESIGN】Dual handle design, the par light can be suspended where you want, and stand up where you want; feel free to adjust the angle.Cool fan: Inside the par light there is cooling fan to extend the lamp life. Simple fashion with stand , flexible and portable in operation. You can set it to one fixed color. Stage Lights not Include white light. ★【MULTIFUNCTIO】The DMX port's inputs and outputs are located on the back of the spotlight to control the lights.Used high quality RGB LED, safe and reliable. The body of this device has been made of high-resistance plastic, use it every day without worrying about the lifetime. Faster installed as it has a nice mountable hook holder that is suitable for any angle and surface. colorful and very beautiful lighting effect, create complex lighting effects for a warm atmosphere. 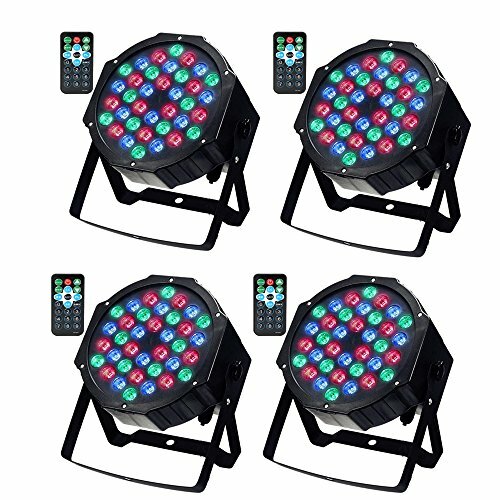 ★【APPLICATION】The best choice of decoration light for indoor DJ, disco, j-show, home, party, bar, KTV, stages, disco, celebrations, birthday gift, family party, small private party, shops, supermarkets and wedding parties, etc.This product is also suitable for all parties , such as family celebrations, friends parties and birthday parties etc. Using LED bulbs in RGB colors to deliver impressive visual effects. ★【 NOTE】Under 16 years old Children must be used this product under the supervision of an adult. If there any issue about this product, please feel free to contact us first,We'll get it resolved as soon as, we will give the best solution in the first time.